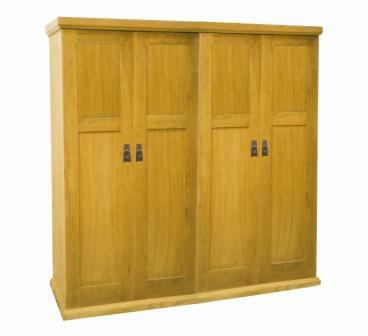 On this page we show a couple of larger wardrobes, with 3 & 4 doors. 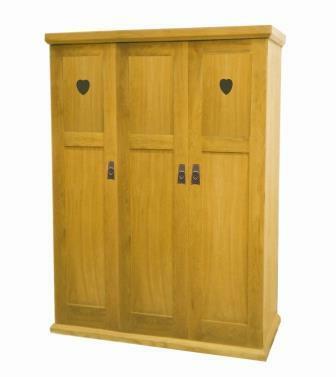 As well as being elegant these have a much larger presence in a room compared to the smaller 2 door robes. The photo above left shows a 3 door robe with a plain oak finish. The photo above right shows the same robe with cut-out heart shapes in the top door panels, a typical Voysey touch. Shown with matching Voysey handles, with a heart pull. 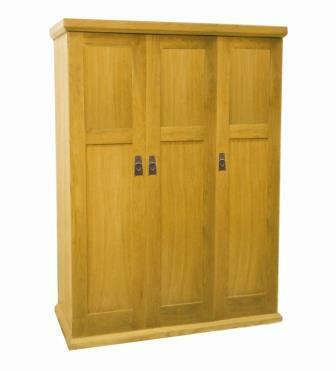 The robe itself is very elegant in a mid Oak finish. As the robes are made to order you can have them fitted out as you like. The robes can be built-in or freestanding. Also, any of the other finishes shown for the 2 door robes can be used on the 3 or 4 door versions. The above photos show a 4 door version of the wardrobes. 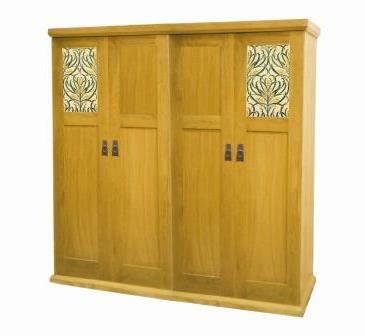 You can have it either in just oak or mix some decorative Voysey panels into the design. Made to order.